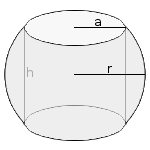 Calculations at a spherical ring. A spherical ring is a sphere with a cylindrical drill hole through its center, like a pearl on a necklace or a napkin ring. Enter at sphere radius and at cylinder radius and height two of the three values and choose the number of decimal places. Then click Calculate.